On January 30, 1987, a US Air Force KC-135 was flying from Elmendorf AFB in Anchorage, Alaska, to Eielson AFB near Fairbanks. The crew of the KC-135 reported a large, silent, disc-shaped UFO at about 20,000 feet altitude. At this time, Anchorage radar control showed nothing unusual. In a moment, radar control asked the pilot of the plane if they still had the unknown object in sight. The frightened pilot replied yes, and added that the UFO was only 40 feet from the plane. The cockpit recording referenced the JAL - 1628 incident, which had occurred only a month earlier. About 1/2 hour later, Anchorage Control Tower relayed a message from the FAA, informing the pilot to contact them upon landing. The FAA wanted a full report on the UFO seen by the crew. The very next day, on January 31, another similar sighting would occur over Alaskan skies. Alaska Airline's Flight 53 reported enormous, disc-like objects. These UFOs, according to the pilot's report, were "tracking" Flight 53. The Control Tower operator related to the pilot that they did not show anything unusual on their radar. 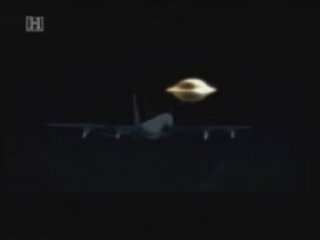 The pilot of Flight 53 was very concerned, stating that the UFO was moving at a mile/per/second, which would be about 3,600 m/p/h. The pilot also stated that the UFO had almost immediately disappeared after flying under Flight 53. Neither of the two encounters were adequately explained by any conventional flying objects, or atmospheric anomalies, and remain a mystery.